Right in downtown Prague, in a renowned hotel on Wenceslas Square, a very unusual restaurant has arisen that should definitely appeal to all lovers of exotica. Hotel restaurants generally aren’t places that the public chooses for good lunches and dinners. And only a few of them, like the Raddisson hotel’s Alcron or the Four Seasons hotel’s Allegro gain gastronomic renown. The Jalta hotel decided to follow in their footsteps and turn its original “cafeteria” into a distinctive establishment that would attract a clientele besides hotel guests. So they joined forces with a competent expert – the Swedish entrepreneur Leif Tommy Sjöö and his company Bacchus Group, which already owns several well-known Prague restaurants. “The hotel’s owner knew the restaurants that Mr. Sjöö operates,” says Tereza Michalová, general manager of Bacchus Group. “He frequently patronized them, and he knew the level of services they offered, and that Sjöö could offer lots of experience,” she adds. Sjöö opened his first restaurant, Brasserie Mozart in the Municipal House, in 1993, but his best-known undertakings are the fashionable Barock restaurant, with mainly Japanese cuisine, and Pravda, with an international menu combining the most popular specialties of Thai, Japanese, French, and Italian cuisines. It’s as if their locations – right in the center of fashionable Pařížská Street – predetermined them to be trendy haunts for Czech and foreign celebrities. Sjöö calls his new Jalta venue HOT, and while it doesn’t disavow its relationship with the other restaurants, thanks to its focus and location it has a much broader span. The menu was composed by the owner, who has drawn inspiration from travels around the world, together with head chef Michal Štěpánek and Thai chef Vong Lianphoukham. Although the restaurant’s name might lead you to believe that your throat will pay for tasting the Asian specialties, the cuisine isn’t all that “hot”. Štěpánek assures us that the dishes are adapted for European tastes, and degree of spiciness can be requested when orders are placed. To make choosing easier, the menu is separated for lunch and dinner. The lunch menu offers mainly sandwiches, salads, and soups, allowing for quick meals. Popular dishes include tom khaa kai – coconut soup with chicken meat, galangal and chili; and grilled halibut with sautéed vegetables and cream-mushroom sauce with Champagne. 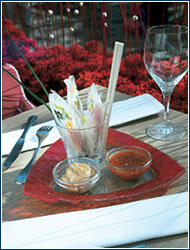 The dinner menu focuses on richer, heavier, mainly Asian dishes, but also serves sushi and sashimi. Regular guests enjoy the salad with marinated chicken meat, chicory, spinach leaves, and soy curd marinated in saké, or tiger prawns in tamarind sauce served with bean sprouts and fresh coriander. An outstanding main dish is prawn wok with fruits and jasmine rice. An ample wine cellar is there for all occasions and tastes, housing wines from traditional wine-producing areas like France, Italy, Spain, and Australia, as well as domestic wines or labels from less typical areas like Bulgaria and Argentina. 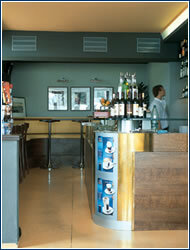 The restaurant’s interior features a combination of styles. The timeless, simple design with Capellini lights and armchairs seamlessly blends three basic materials – glass, metal, and wood – and three basic colors – white, red, and black. 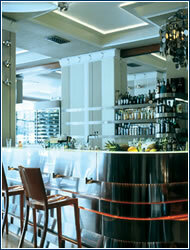 The effect is fresh and uncomplicated, while still respecting the restaurant’s original interior with art deco elements. Additionally, it’s optically divided into two parts – the open bar in front and the terrace are intended more for quick lunches or short breaks over a glass of wine. The rear part of the restaurant is a bit quieter and more intimate, and thus more suitable for dinner. In the future you should be able to experience something truly unusual, the house place of honor – a table right in the kitchen, where you can watch the cooks at work. 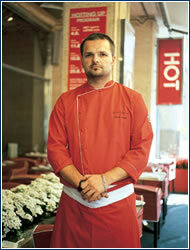 However, HOT has greater ambitions than just serving food and drinks. The owners’ aim is to create a lively, metropolitan establishment where people like to return for entertainment. So far, the venue is a regular performance space for popular DJs or singers such as Yvonne Sanchez. THIS UNASSUMING bistro can be forgiven for playing the occasional Roxette disc, if only because they have the best fish & chips in Prague 7. Other stand-outs on the menu are salads that boast more greens than just iceberg lettuce, pasta dishes that are fresh and well-prepared, and nice coffee drinks or “breakfast” items served all day long. In addition, the interior is bright and spacious, the staff is courteous and smiling, and an impressive array of Algerian wines is available. Those living and working in the area can only hope that La Batterie Café will prompt other restaurateurs seeking a site for mid-range, tasteful venues. For many years what was a 17th century Franciscan monastery in the center of Kroměříž fell into disrepair, and finally the city sold it to a private party. Unbelievably, the unexpected came true, and thanks to the new owner, the ruins have become a complex that is now the pride of the city. 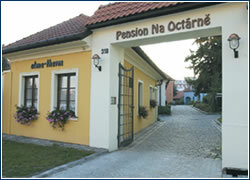 Sensitive reconstruction led to a modern pension, Na octárně (the building was formerly a vinegar factory), which during its short history has built an excellent reputation, thanks mainly to its well-stocked wine cellar and restaurant. The menu is dominated by meat dishes (especially beefsteaks, game, and poultry) but lots of space is also given to fish. The interior is supplemented by an autumn garden and romantic subterranean spaces, where one can quaff high-quality wines without interruption. For a reasonable price you can sleep over at Na octárně, and the outdoor hot tub and sauna is open to guests and visitors. EC/MC, Visa, DC, JBC, Amex.